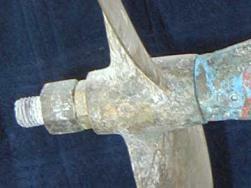 Protect your propellor with a zinc anode. The sacrificial anode is eaten up by electrolysis more easily than the zinc in the bronze alloy of your propellor, thereby saving the expensive propellor with an inexpensive anode. Most Alberg 30s seem to have a 7/8" shaft, though I've heard of some with a 1" shaft. Get the size that fits your boat. A 7/8" shaft has 5/8-11 threads on the end, and a 1" shaft has 3/4-10 threads. Camp acorn zinc and prop nut. The zinc is internally threaded and screws onto the prop nut, which has a thread to receive it. You may have to cut off the tip of the zinc to clear the rudder. I also cut down the nut, itself, to reduce the amount of zinc that had to be removed for clearance. The replacement anode is part #ZPC-1. 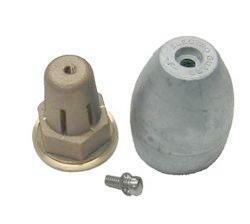 This anode has 3/4-10 threads and fits both the 7/8" and 1" Camp prop nuts. 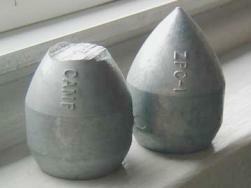 These prop nuts appear to be discontinued, though Camp still offers the zincs. ElectroGuard prop nut and zinc is held on with a cap screw. Unfortunately, replacement zincs do not come with a new cap screw, so you need to order that separately. Bronze cap screws can be hard to locate. For a 7/8" shaft, use part # PN-2004-R for the entire unit and PN-B for the replacement anode. 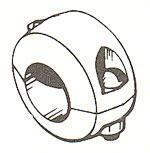 For a 1" shaft, use part # PN-2006-R for the entire unit and PN-C for the replacement anode. 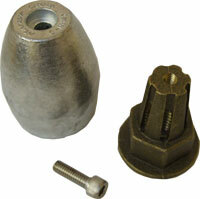 Canada Metal (Pacific) Ltd. makes a similar nut and zinc which it sells under the brand Martyr Anodes. For a 7/8" shaft, use part # CMPNBC11Z for the entire unit and CMPNZB for the replacement anode. For a 1" shaft, use part # CMPNBC10Z for the entire unit and CMPNZC for the replacement anode. I also learned a lesson many years ago after occasionally finding relatively new zincs gone including the screw and lock washer only a few months after installation. Once when the yard manager sold me a new zinc he advised me "seat" it with a light hammer hit before attaching the screw and lock washer. As he pointed out most of these zincs have little casting imperfections (flashing?) on the inside where they seat with the bronze male nut. As these thin ridges of zinc quickly wear away the zinc becomes loose on the prop nut and the lock washer becomes useless. I have not lost one since following his advice. Another kind of propnut and zinc. I don't know what manufacturer this is. Standard "donut" zinc to fit around the shaft, if you have enough space. This would go between the prop and the stuffing box.